I’m doing some research on how to onboard yourself once you land your next job. I found this great (important) article on TheMuse titled 6 Things to Do Before Leaving Your Job. 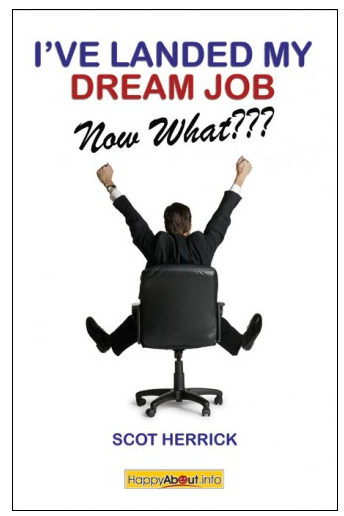 A book I’ll recommend is Scot Herrick’s I’ve Landed My Dream Job – Now What??? This book helps you plan your first 30 days on the job, and includes thoughts on wrapping up well from your last job. In the amazon review I love the person points out that Scot’s book helped her put together a 30/60/90 day plan… FOR AN INTERVIEW! So maybe this book is a great interview prep book… ? When writing the book, I had not thought of it as an interview prep book – but there is some good sense in looking at it that way. Since you should be learning if the company and manager is a good fit for how you work, it’s smart to find out how the manager sees a new hire to contribute to the group, to know what business goals are important and how a new hire would help meet those goals. The book also talks about what to do before you leave your current job, so the entire transition process is covered. Lots of mistakes are made between notice and leaving. Having a plan around that transition is important. 2. Archive – hopefully you have been doing this all along, so you will already have what you need. For a lay-off situation, there may not be much of an exit interview. The other items will still apply. @Scot, I had never thought of it as an interview book either, but it’s a great idea, and part of a holistic career management view. What you teach in the book should be a part of how we think about transitions. @Ed, you are right. I think Leslie was writing for the newbie generation, and I don’t think authors there are talking too much about involuntary transitions. Still pretty pie-in-the-sky :p Thanks for weighing in.